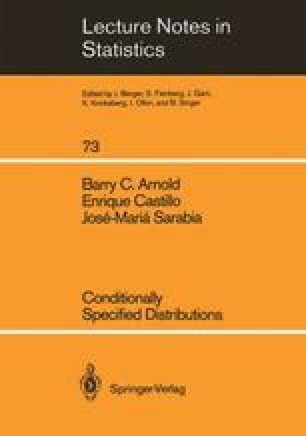 Almost all of the conditionally specified distributions introduced in this monograph are cursed with the presence of a term ec. All other parameters save c are constrained to belong to intervals in the real line. The parameter c, we are blithely told, is chosen to make the density integrate to one. As a consequence, c is, in fact, an often intractable function of the other parameters. In a few cases an explicit expression is available (eg., the exponential conditionals density, equation (2.34), the Pareto conditionals density, equation (5.7), etc.). In such cases maximum likelihood becomes less troublesome. In most cases, however, more devious means will be desirable. Pseudolikelihood and modified method of moments approaches have proved to be viable approaches. They yield consistent asymptotically normal estimates. The awkward normalizing constant hampers the likelihood enthusiast but, in fact, is even harder on the Bayesian investigator. Some tentative approaches to Bayesian analysis of conditionally specified densities will be sketched in Section 9.7. More work and more insight is, however, needed in this direction.